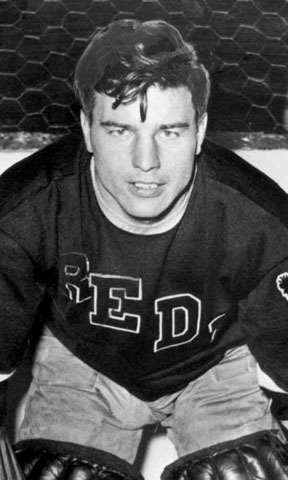 A “Class of 1963” charter inductee, Frank Brimsek, named “Mr. Zero”, has the best all-time Goals Against Average (GAA) in Red’s history for goalies playing at least 50 and less than 100 games. From 1937 to 1939 while playing for Providence, Brimsek held a record of 30-18-9 with an amazing Goals Against Average of less than 2 a game. Between the years 1938 to 1950, Brimsek played 514 NHL games in the nets for the Boston Bruins where he compiled a record of 252-182-80, with 40 shutouts and a 2.70 GAA. Brimsek was inducted into the NHL Hockey Hall of Fame in1966 and the United States Hockey Hall of Fame in 1973.